As the winter break is on the way, Real Madrid football players get their time. 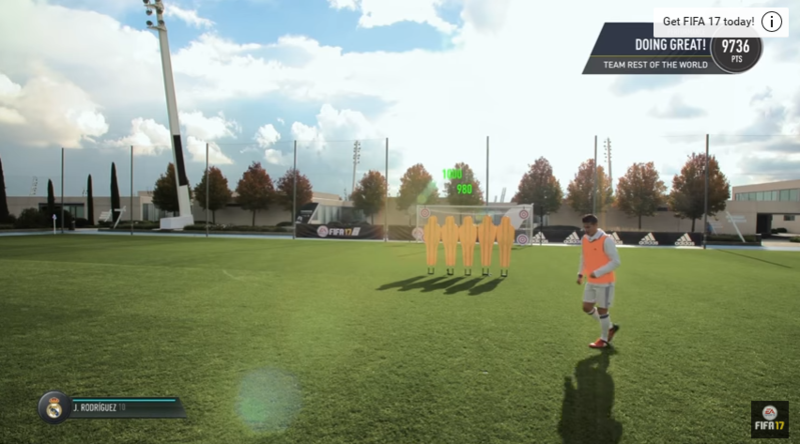 This time, some of the players, like James, Benzema, Carvajal, Navas, Lucas, Varane, Asensio, and Ruben Yañez are featured in EA's new promotion campaign - Skill Games Challenge. The Eight players are split into the two teams, the team Spanish featured Marco Asensio, Dani Carvajal, Ruben Yanez and Lucas Vasquez, while the team Rest of the World consisted of James Rodriguez, Karim Benzema, Raphael Varane and Keylor Navas. The video shows that Real Madrid goalkeeper Ruben Yanez stuns teammates at first in the challenge. It seems James Rodrigue dominates the skill games challenge. All of them do a great job. What do you think of? Some fans indicate FIFA should do the video longer. Obviously, fans get lots of passion for them, especially James. You can watch the video on EA SPORTS FIFA Youtube channel. Let's watch the video below to see who is on the top. Then for those who are struggling with the game, or lack of fifa 17 coins, we can provide you tips as well as coins. You can get fifa 17 coins cheap on our online store u4fifa.com. If you come across any problems about your order, you can connect us on live chat. Have a nice day.